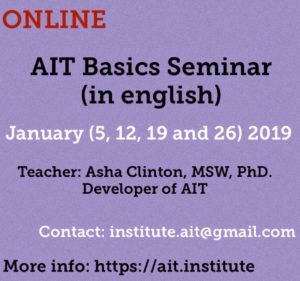 Asha Clinton, MSW, PhD, the developer of AIT, will be teaching an online AIT Basics Seminar in English this January 2019. January 5 — 90 minute WEBINAR on muscle testing. January 12, 19, and 26 — 10 a.m. to 6 p.m. Eastern Standard Time. Teacher: Asha Clinton, MSW, PhD. 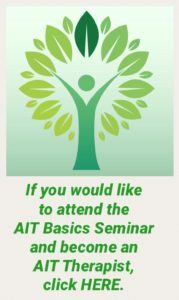 AIT basic theory, the AIT Trauma Protocol, 3- Step Transformation, the Core Belief Protocol, Core Qualities Protocol, Quick AIT and Instantaneous AIT will all be taught with plenty of time to practice. You will leave each day of the seminar ready to treat your clients with what you learned that day. Please register now. Although you will be able to practice online with an online partner, for the best possible experience, please ask a colleague to register and partner with you. In this way, you can enjoy live practices with Asha and her trainers answering your questions and helping you practice, and have a deeper experience. Fee: US$690, which includes three full days of training plus additional training in muscle testing. Transportation, hotel, and rental car fees: unnecessary!! Please join Asha. Your clients won’t stop thanking you. If you are interested in attending this Seminar, please CLICK HERE.